I’ve spent all day with an internal struggle about the limits of my acceptance of other people. Probably a much too serious intro for a post about pancakes, but bear with me, you might have some insight I could really use. I’ve always prided myself on being a person who is able to see people for who they are, in the context of their own culture and life experiences and find beauty, talent and value without the qualification and framework of my own situation. Whether it be a trailer park in South Central Los Angeles, a cave in Morocco, or a bus bench in Greece I’ve always been able to do that. Easily. But today I was challenge with a though: what about hateful, small-minded, bigoted people? Are those people I should love and keep in my life? I had an interaction with someone who left me wondering about my assertion that I have the anthropological capacity to care about other people regardless of who they are, what their beliefs or culture dictates, without judgement. Can I judge someone merely for judging others? Isn’t that the epitome of hypocritical? Isn’t the greater definition of open-minded and open-hearted to love those who are a challenge to love? I do believe that there is good in everyone. But is it worth it to try to dig past the hate and anger of a racist or homophobic friend or family member, or is that level of toxicity a fundamental deal breaker? If you have some insight, let me know. For now I will proceed with caution, because the bottom line is I want to love everyone. I don’t want anyone, or any group of people, to be designated as a group I should hate. Because hate just breeds more hate. In a bowl add the flour, oats, salt, brown sugar, baking powder, brown sugar, cinnamon, and nutmeg, mix until well combined. Make a well in the dry ingredients, add the milk, egg and vanilla, stir until just combined. Add the raisins and stir. Heat a griddle or skillet over medium heat, coat with cooking spray. Drop about 1/4 cup of batter on the hot griddle. Cook until dry on the edges and bubbles start to form in the center. Flip and cook on the other side until cooked through, about 2 more minutes. 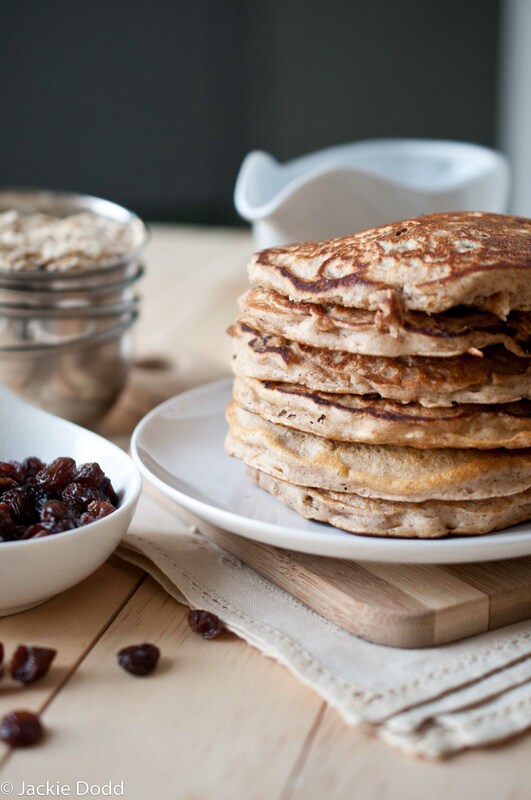 First – oatmeal pancakes = amazing. I made some last month and fell in love with pancakes all over again! Second – I think you are right in saying that open-minded and open-hearted means loving those who are the least-deserving of love, and the hardest to love. You have such an amazing heart, it’s truly visible, and I believe struggling with things like this make us totally human, I struggle with the same things. Every single person on this earth deserves to be loved and to be seen for who they truly are, regardless of race, color, sexual orientation, religion or other. I know I judge other people. It’s a terrible thing that I wish I didn’t do and I try hard not to but I’m flawed – But I also know that I reach out a hand when a hand is needed, I pray for others, I serve and I try to love my neighbor. Maybe intention has everything to do with it. I so wish we could talk about this on a park bench with a cup of coffee in hand! I applaud you for bringing up a topic like this – you are a wonderful person Jackie! I hate when people say that they DON’T judge others, it just shows how much they lack self awareness. We all do it, unfortunately, and it’s just about commitment to the struggle to fight against it. I think with this issue, I struggle with whether or not I WANT to fight against my judgement of bigoted people. And I SO wish you and I could have drinks someday, you are one of the most genuine and accepting people there is. These photos are just stunning, first of all. The pancakes sound delicious. And I think I struggle with the same thing. I feel a lot of anger toward the people you describe because of their actions and the way the effect those around me. But mostly I just keep my mouth shut and try to understand their point of view. So far no luck. I hear you. I sometimes feel like if I can try to understand why and how they came to the conclusions they did about other groups then maybe I can say something to change their minds. But sometimes it seems like that is just delusional! 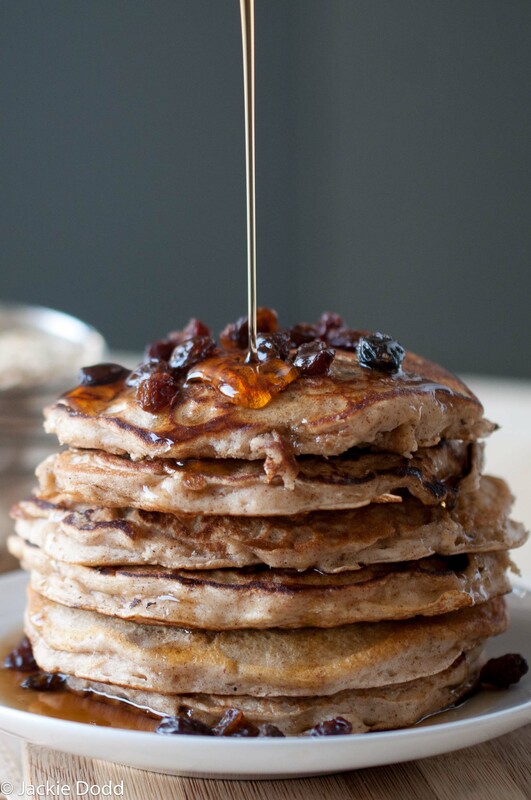 The pancakes look absolutely stunning – I would love them for my breakfast! Realistically, I think everyone judges other people to a degree. It’s human nature. I think being aware of it and at least pondering ways to be more accepting (even to those who we think may not deserve it) is a good step in the right direction, and one I certainly should take more often. Absolutely. I work hard to recognize my own judgments and try to fight them, it seems like the more you allow yourself to be aware to more constant that struggle seems. I’m just not sure I want to allow bigoted people in my life long enough to try and temper my own judgements against them. Beautiful photos! These pancakes look amazing. I try not to judge others, but I think unfortunately its something we all do. In LOVE with these pancakes! That’s my struggle at the moment. Do I stay friends with someone like that and hope that I can in some way be catalyst for change or is it even worth the toxic energy that it brings in my life? Ha! I have no problem judging myself way to critically! I don’t believe that I’ve been fascinated with someone withinside my own views. I only keep company with those who believe the same as me. I would give a big F-U to someone who was homophobic or racist. Those pancakes look great–I think I will demand them the next time my husband and son make me pancakes! As for the other topic, here’s my thinking: if these people are family members, you’re stuck with them, and just have to do your best to try to focus on the good in them (and if you’re me, provoke them occasionally on the issue. But apparently I’m a bit on the confrontational side). You ask “Can I judge someone merely for judging others?” But bigots do not judge individuals–instead, they hate/judge groups, indiscriminately. Bigotry denies the individual qualities of particular people and makes sweeping, broad, wrong judgments about whole groups of people. While everyone is worthy of being treated with kindness, I personally don’t feel that spending my energy on a friendship with a bigoted person is worth my while. You can hope that they’ll change. You can pray that their heart will be turned. But you don’t necessarily have to spend your time trying to make that happen. Provoke them occasionally! I love that since I do that too. I do have a big family who are all along the progressive to bigot spectrum, but there are also people from the very small town I grew up in who try so hard to hold onto small-minded views. I guess I selfishly hope to be an inspiration and catalyst for change and have a hard time giving up on someone I truly see good in. But you may be right, there are so many other people in this world to have relationships with. Beautiful photos!! The pancakes look so good! Hello There. I found your blog from foodgawker. I love these pancakes. I hate homophobic people and I don’t care. I don’t want to like them or have relationships with them, I have too many gay people that I love who are more important to me. Deal breaker. 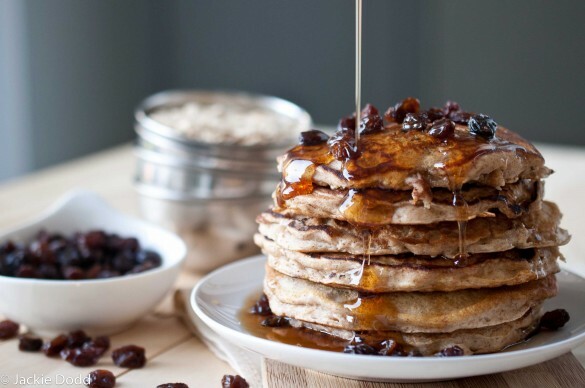 WOW, those pancakes are going on my must make immediately list. Like as in maybe will have breakfast for dinner tonight kind of immediate. They look so good and I am sure they are! I feel your pain on this issue. It is so hard. Personally, I have a really hard time associating myself with people that have that kind of hate in them. I try to look past it and if it is someone I NEED to deal with on a daily basis then maybe just try look at their other qualities and focus on that. If it is someone that maybe I only see once and a while…then perhaps just deal with it as it comes and try not to speak too much to them when the time comes up. I have a very difficult time seeing how some people are so hateful, but what I normally do is try to stay out of those hateful conversations as much as possible. Cutting that kind of negativity and hate out of your life is better than trying to combat it in my opinion. I just left a super long comment and of course the internet cutout and safari just completely shut out on me. If I end up leaving 2 comments, sorry! The pancakes here are fabulous. I’m totally saving this recipe for a Sunday brunch, although I would love to make this during the week. But let’s be real – getting up at 5AM is already a struggle to get to work on time. I don’t think I could wake up any earlier. As for the other stuff – I judge people. I hate to admit it but I do. I struggle with this though because I wish I could be the person that doesn’t judge, no matter what he or she does, thinks, or says. I have a tendency towards judgmental-ness, but I justify it by saying it’s only with people who deserve to be judged. Probably not the best attitude to have, though. I try to tell myself that people who have ugly beliefs hold them out of ignorance, out of not being exposed to certain things, etc. But anyway. Gorgeous pancakes. The photos are amazing! These are GORGEOUS!! I just saw them on TK and started to drool! Okay…I had to stare at those pancakes a bit before I got deep. By the way…I want one. I definitely struggle with those situations too. I like to look for a moment when I can hopefully affect a change with some calm conversation. Sometimes I have that patience for someone and the faith that they will see things in what I think is a more fair, healthy way. Sometimes I don’t have that patience and if the interaction is too toxic I make my exit. I like that you brought this topic up. 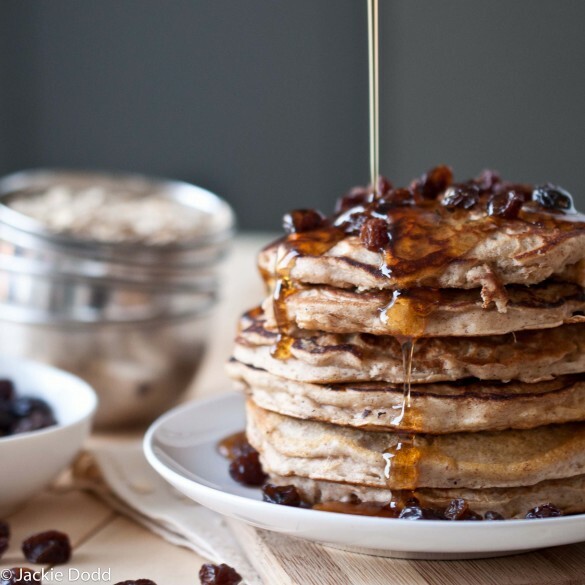 Oatmeal cookies pancakes are an inspired idea!! I need to try this! Love them (if you must) from a distance. Oh, my. These pancakes are the best. I didn’t have raisins, so I subbed dried cranberries. Didn’t hurt the flavor at all. 🙂 I am passing this on to all my foodie friends. Thanks. Hi Jackie! I saw these on FG and now on TK. Wow girl, you have some sweet skills with that camera. Love the lighting and the set up of your shots! And hello, they look deliciousss. Also, your thoughts about judging, open-mindedness, etc. are hard but I think also good things to think about. What I appreciate about what you said is that you are turning it back on yourself and trying to understand them instead of jumping on them for their own hate issues. Hard stuff, for sure! Thanks for your honest post. Thank you so much! My photography journey has been bumpy, but I’m so committed to learning and growing. I still can’t even refer to myself as a “Food Photographer” even though I’ve done some paid gigs because there is still so much more I feel I need to learn! It’s okay, even important, for me to judge people’s behavior as wrong or unethical. But if I say “I hate haters” then a) I have made the same mistake they’re making, and b) I’m saying that I hate myself! So my goal is to stick to judging _behavior_ while maintaining awareness that wrongheaded people have exactly the same _innate worth as human beings_ that I do and everyone else does. Or more briefly: being more right than someone else about something–even something important–doesn’t make me a better human being than he or she is, _because there is no such thing! Of course, stating this principle is easier than living it. (Hence some of the people who profess to “Hate the sin and love the sinner,” which is the same thing in more traditional language, but really think they’re “holier than thou.”) And knowing the principle doesn’t give me unlimited time and energy to engage people who have racist/homophobic/sexist beliefs. But I’m hopeful that it will help guide my emotions and responses when the need arises. Thanks for raising such an important issue. Thank you for your insight Perry! I don’t know much about the Humanistic Religion, but I’m so flattered that this post was shared and I loved your views. And I agree with you about the “Love The Sinner Hate The Sin” line, It makes my skin crawl. We all have way too much going on in our own lives to worry about ever get around to the “luxury” of having any hate for someone else’s sin. That line should just stop with the first word, erase those last five and you’ve got something there. [Shameless plug alert!] Jackie, if you’re curious about humanistic religion, you can check out the Wikipedia page on Religious Humanism or the web sites of the American Ethical Union (www.aeu.org), the Unitarian Universalist Association (www.uua.org), and/or the Society for Humanistic Judaism (www.shj.org). I have made these pancakes twice now and each time they get even more delicious if thats possible! Im from the South of England and pancakes aren’t always made a great deal, but these are starting to become and sunday morning tradition. WOW! These look spectacular! I love that you included the raisins for a chewy bite. Can’t wait to try these! I have cut my grandmother out of my life because she is a toxic person. I’m not judging her, just accepting the reality that she lives to stir up negativity and hurt people. She has already wreaked havoc on my life, but I will not allow her to get her tentacles around my husband and children. The buck stops with me. If she were to apologize and make a concerted effort to change, I would have to reconsider…but I’m not holding my breath. I don’t believe in trying to maintain relationships with everyone regardless of their behavior. I certainly can’t expect people to love me if I behave like a jerk, and neither should they. Good for you. Especially after we have kids, putting distance between our family and toxic people is important. I have an easier time cutting people out for the sake of my daughter, even family members. Before I was a mom, it was a lot harder. These are the BEST pancakes I have had in a long long while. They taste exactly like an oatmeal cookie. I had mine topped with blackberry jam and fresh strawberries- perfection. Then I made just one more for myself with just a dollop of real, local maple syrup and it was pure perfection. I’m fairly sure that this recipe is what has been missing from my life. Everyone needs to make these. Now. Thank you so much for sharing your recipe and personal reflections! Out of all of the photos of pancakes I had to choose from I was most tempted to look more closely at yours. The feeling that sent me to your site was one of attraction. I was attracted to your pancakes because they were beautiful to me! I, like you, find it fairly easy to see beauty in an array of individuals and places. This shared trait is because we are probably both very open minded people. On that note, I challenge you to rethink the very definitions of a few words your troubled post is centered around. The words are ‘judgement’, and ‘love’. I want you to consider the fact that these are not feelings. To judge. It is actually what makes us human. We constantly judge order to survive and succeed; to make choices is to judge. There is nothing wrong with judging. The error or sin comes with what we decide to do with that judgement. I know you were using the word in a different way, but I say it is important to make a distinction between one’s judgement and what one chooses to do with the conclusions he or she comes to or the feelings the impression draws out. That brings me to the word love. I see on this page the word ‘love’ used in this way, “I love breakfast food…” Of course what we mean when we use the word in this way is, “I enjoy breakfast food…” I recently made a gift of 39 pictures complete with captions about why I love my husband under each one. “I love you because you are a great friend to others… I love you because we are cute together…” What I really meant was reasons why I enjoy him. This was implied by the context, of course, but the sad truth is that the flippant use of the word love has devastated our culture. Marriage, politics, and friendships are all being eviscerated by this misunderstanding of the most intrinsic human quality. Here is a definition I would challenge everyone to meditate on and apply. To love someone is to purpose to benefit that individual without expecting anything in return. The King James Version of the bible actually translates it as charity. This could be done in a feel good way that is enjoyed by both parties, in a horribly uncomfortable way, such as pointing out bad choices they are making with their lives, or in an innumerable variety of levels in between these extremes. Maybe forgiveness, even if never expressed, is the best way you can love someone, but in order to reach that point, we have to admit that we see them as being wrong in some way, which involves some serious judging. Truth is not relative, it is absolute, so someone has to be wrong at some point, and that isn’t beautiful, but it can be loveable. So, in short, we do not have to agree with others and we do not have to approve of what they are doing to love them. 1 Corinthians 13:1 If I speak in the tongues of men and of angels, but have not love, I am a noisy gong or a clanging cymbal. Very moving introduction. A lot to ponder over these beautiful pancakes. Is there a way to premix this batter? Will it keep for one night? Your photographs are beautiful! 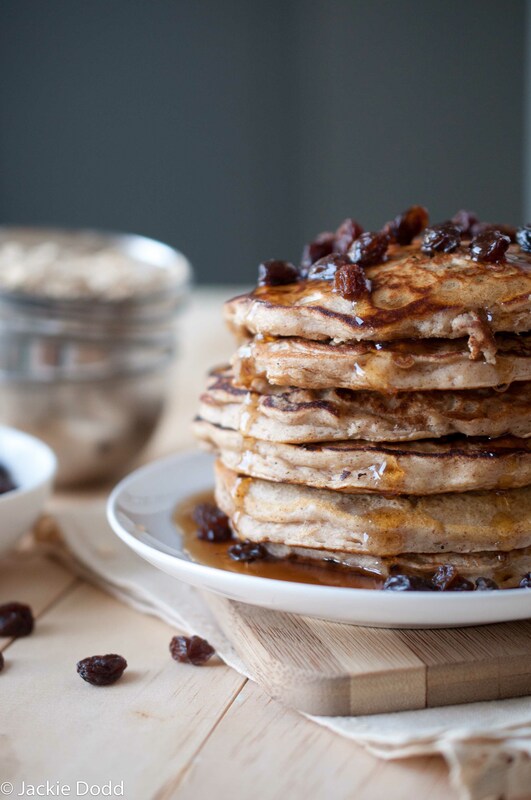 I can’t wait to try this oatmeal cookie pancakes recipe soon. Just shared this post out – as someone mentioned earlier the images are awesome but the recipe itself is delicious. I think it’s the cinnamon and nutmeg that really make it sing. Thank you.